GIGA GRANADA HILLS: Let's create a pedestrian and bike-friendly plaza at Chatsworth and Zelzah Streets in Granada Hills! 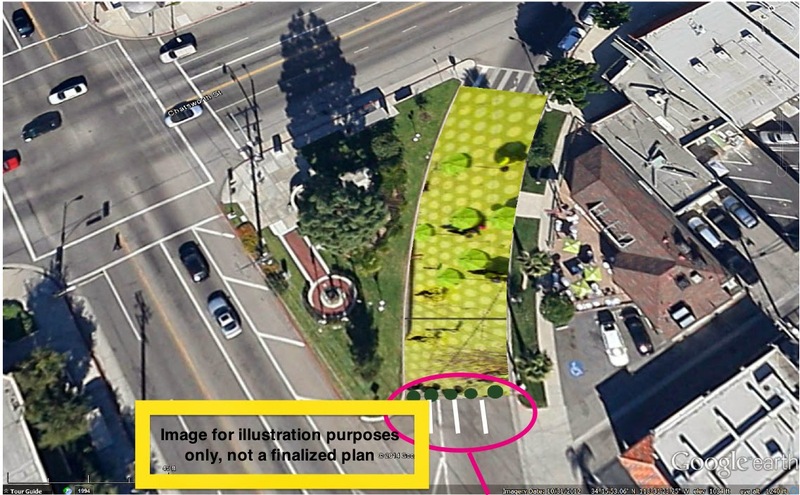 Let's create a pedestrian and bike-friendly plaza at Chatsworth and Zelzah Streets in Granada Hills! Wouldn't it be great if Granada Hills had a town square? A place to sit down and eat on food truck nights? A place for public music performances? Free dance classes? Or a place for people to just come together and enjoy? We want to create one. We love the lively street life that the food trucks have brought to the sidewalks of Chatsworth Street. But food trucks come and go. To maintain that lively atmosphere, we need to create something that is ours. In cooperation with the City of Los Angeles' People St. program, we want to expand Veteran's Triangle Park, at the corner of Chatsworth and Zelzah Streets, all the way to Menchie's for a temporary, 12-month pilot program. But doing that requires community support. And that's where you come in. Any inviting gathering space needs tables and chairs. It needs umbrellas for shade. It needs trash pickup. And most importantly, it requires an enthusiastic base of supporters. Donating to this project shows that you think it should happen! Right now, this project is just in the idea stages. We have to complete an application to the Los Angeles Department of Transportation by October 1. If LADOT approves the application, work will begin to temporarily block the turn lane to vehicles for one year. Q: How are you going to expand Veteran's Park? A: By working with the Los Angeles Department of Transportation to convert the redundant diagonal right turn lane from Zelzah to Chatsworth into a pedestrian plaza. Q: Won't this ruin traffic? How am I supposed to turn right? Actually, instead of every car stopping every time, as you do now at the stop sign, you'll turn right at the light, which will be green about 50% of the time. This change would mean that if you hit the green light, you won't have to stop at all. And if you hit the red light, you can still legally turn right once it's safe. 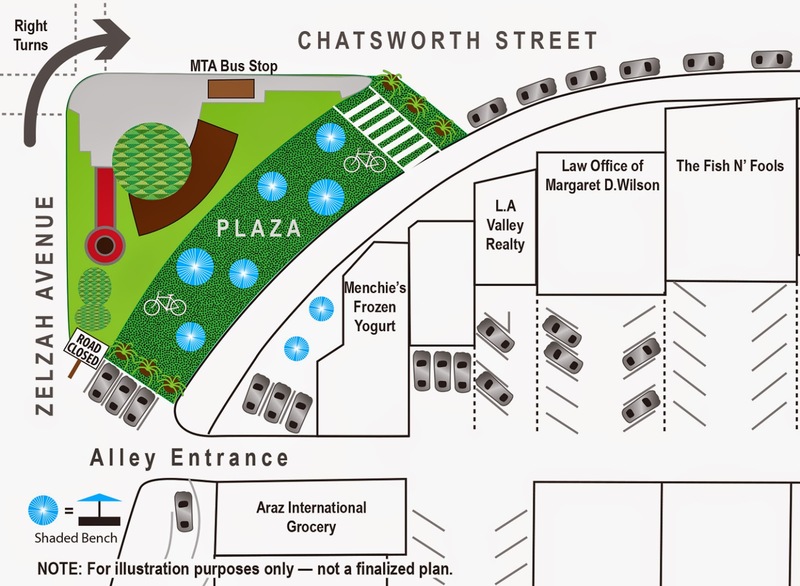 In other words, right turns from Zelzah onto Chatsworth will work just like they do at the vast majority of normal intersections all over Los Angeles. Q: If the street is blocked off, where am I supposed to park? A: It's true that closing the redundant right turn lane will result in the loss of four parking spaces directly in front of Menchie's. But we expect that the loss will be offset by the addition of more parallel parking spaces on Zelzah, and offset by the increase in people who visit on foot, by bike, or by public transit. There is the possibility that you may have to walk an additional 50 feet or so if you're headed to Menchie's for a frozen yogurt treat. But think of the calories you'll burn. Q: But will it be safe? Won't people crash into the plaza, because they're still used to turning right there? A: This project will be engineered by the Los Angeles Department of Transportation, who will create lane striping, signage, and safety barriers. So yes, it will be safe. Q: Will this project ruin business? A: It's our belief that more foot traffic, more gathering places, and greater pedestrian safety are good for business. A similar project was undertaken in Silverlake, and a clear majority of local business owners felt that the plaza was positive to neutral for their business. Just because people leave their cars doesn't mean they leave their wallets. • More free community cultural events. People St mandates that all programming in the plaza must be free of charge, and we agree. • More safety for students who walk through the area to get to and from Granada Hills Charter High School. • More safe and easy access to Veteran's Triangle Park. • More vibrant street life on our main street. • More pedestrian-friendly space to enjoy. • Something that belongs to us. The food trucks brought life to Chatsworth Street, but food trucks come and go. What happens if they decide to leave? Then we'd still have this plaza. Q: What organization are you with? A: Um, none. We just live here. We don't stand to gain financially from this project. David is a lawyer. Linda is a freelance writer who also writes a blog about Granada Hills for free. We just want to see the community we call home thrive. That's about it. However, we are undertaking this project in cooperation with a number of organizations: primarily the City of Los Angeles and the Los Angeles Department of Transportation. We're also reaching out to the Granada Hills South Neighborhood Council, the Granada Hills Business Improvement District, and Councilmember Mitchell Englander's office. The project won't happen without the cooperation of all of those organizations. But most importantly, we want the people of this community to participate too. This Kickstarter is undertaken not only to help fund the creation of the plaza, but also to show all of those organizations that this project is wanted and supported by the community at large. We are all for it and think it is a great idea that would improve both the community experience AND business in that area! I just read about this on bikinginla.com I live out of the area, but shop with my mom at Ani Bakery (in fact, eating my Ani's maneishe as I type!) and Araz International several times a year. This plaza proposal is a wonderful idea! If a plaza existed now, I can guarantee that we would spend extra $$ at Royal or Menchie's (something we never do) and enjoy a leisurely morning at the plaza. Message to local businesses: This is a good thing. Help make it happen!